In this session, we started with a discussion of the gap between value and price and how investors and traders view it. We then followed up by looking at the pricing process and how multiples standardize prices. In the last half of the class, we looked the first three steps of deconstructing multiples from defining to describing to analyzing multiple as a prelude to applying them in the next class. Today we're going to put our pricing hats off to a few pricing questions before we get started. The first is I'm going to give you evidence today that most people out there prefer to use pricing multiples on comparable speed ratio and 15 companies. And if you ask equity research analysts why they do not like to do DCA why they prefer to usee.V. to Cezary ever DRPA. The answer you usually get is hey for the dude to do it discount it gets to Melhuish need to make assumptions about growth than risk cash flows all those things you had to do and your DCF. Best new pricing you don't have to make those subs. Is that true. Is that a good reason to use pricing because that's often the most common reason given for why people like multiples and comparables is you don't have to make assumptions about cash flows growth and risk. Been used 22 times earnings of five times revenues or three times book value. Are you making assumptions about cash flows growth and risk. You know the only thing is you're making them implicitly you don't even know what you're making in it and it sounds to me that strikes me as a very dangerous game to play. So yes a difference in this kind of cash flow valuation actually explicit about your assumptions. In multiples your implicit about your assumptions. The advantage of being implicit is if people don't know what you see with the word growth. They can disagree with you. It's so much easier to sell a pricey one of the things we're going to talk about today. But it's not true that when you use pricing you're not making assumptions you're just making implicit assumptions. And today I'm actually going to give you a very simple technique to make those implicit assumptions explicit. So you'd be that these three variables. This is the relationship question. 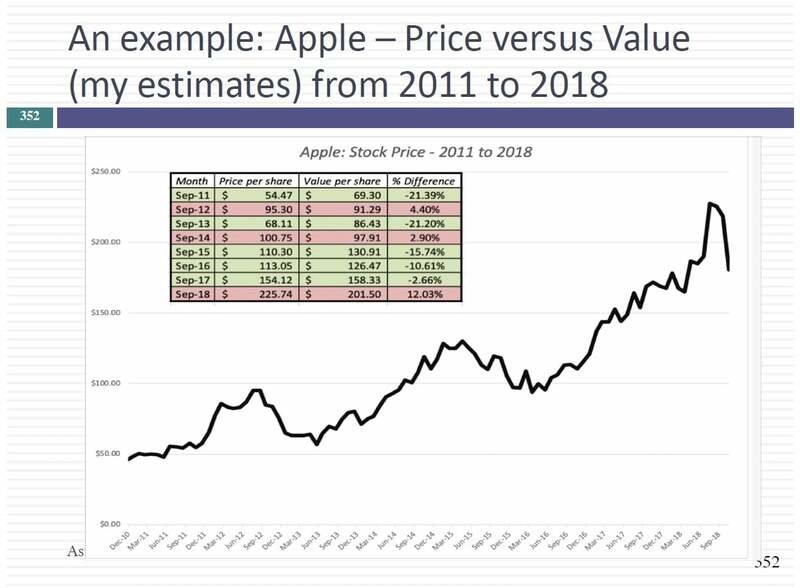 You are assuming the market in fact remember when we when we started this crisis I said any time you sit down to put a number in a company you're making assumptions about markets in intrinsic valuation. We assume that markets make mistakes on companies and correct them over time. That's why we buy cheap stalking in pricing. We assume markets are correct on average but that they mispriced individual stocks. In other words on average chemical stocks are correctly price but individual chemical stocks might be mispriced. So you're making an assumption about markets being right on average using what I assume that markets are right on individual companies then you believe in efficient markets. So pricing you are making assumptions about markets and we talk about why that assumption might suit you as an investor as a portfolio manager because of the way you get judged and evaluated. This is why you estimate the P ratio for all companies and I'm going to show you a frequency distribution. Remember to distinctly put a histogram and when Shade's to them affiliations. Can that. Distribution ever be normal. This requires some digging up your basic statistics. Can the distribution of ratios across U.S. stocks or across global stocks be known. What does a normal distribution require. Teos on both sides. They have to go from minus infinity to plus infinity. No multiple can ever be normally distributed. Why not. The lowest value you can have. Zero. Once you get below zero your dot. Is not it's not meaningful not available. You're going to perish less than one. You present overpriced meat incredibly cheap stock or something's going crazy with the stock. But the ratios of Florida are what's the highest value you can date. Fifty thousand is no way I want to share the distribution of treasure. They're going to be shocked by the highest number you're using. Who cares if you're not a statistics class. I didn't pay enough attention during my statistics class so make a confession I never thought I would ever need that stuff for the rest of my life. Because you know how much of stuff we do on a day to day basis is built on the presumption of symmetry and normal distributions. I'll give you a simple example. How often have you heard of sandspit this stock is cheap because it trades at less than the average P for the sector. It's in fact the most common said Spetz that equity research analyst use what's wrong with it says bridge. The average is a good measure of distribution if you have a symmetric distribution but if you have an asymmetric distribution like the one I have the average is not terrible number to focus on why. Of all your outliers a big positive number is what's going to happen to your average. It's going to get pulled down. And remember the statistics class have had a sensible statistics professor and I don't know whether you did. What you were told to do.